"This is an incredibly moist banana cake from a mix... 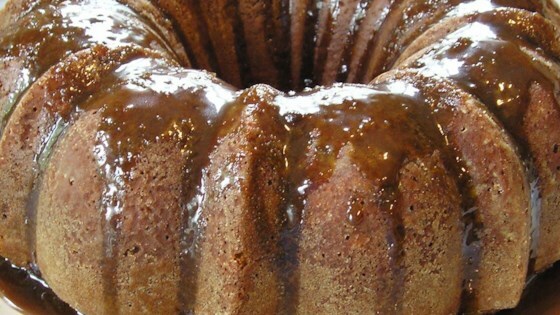 I always serve it with caramel icing and get raves every time!" Preheat oven to 350 degrees F (175 degrees C). Grease and flour a 9x13 inch pan. Put 1 tablespoon lemon juice in a measuring cup with 2/3 cup milk. Set aside. Mash bananas with a fork, adding the remaining 1 tablespoon lemon juice to them as you mash. Set aside. In a large bowl, combine cake mix and baking soda. Stir to combine. Add bananas, softened butter, milk mixture, eggs and vanilla. Beat at low speed until moistened (about 30 seconds). Beat at medium speed for 4 minutes. Pour into prepared pan. Bake in the preheated oven for 30 to 35 minutes, or until center of cake springs back when lightly tapped. A toothpick stuck in the center may leave a slight crumb. Allow to cool on a wire rack.